John had eye surgery today to remove a cataract so he needed a little comfort food – lentil soup with turkey sausage. Since I was cooking solo I really wanted this to come out well. I started out with a sauté of small dice of onions, carrots, and celery, then added the smoked turkey sausage and chicken broth. 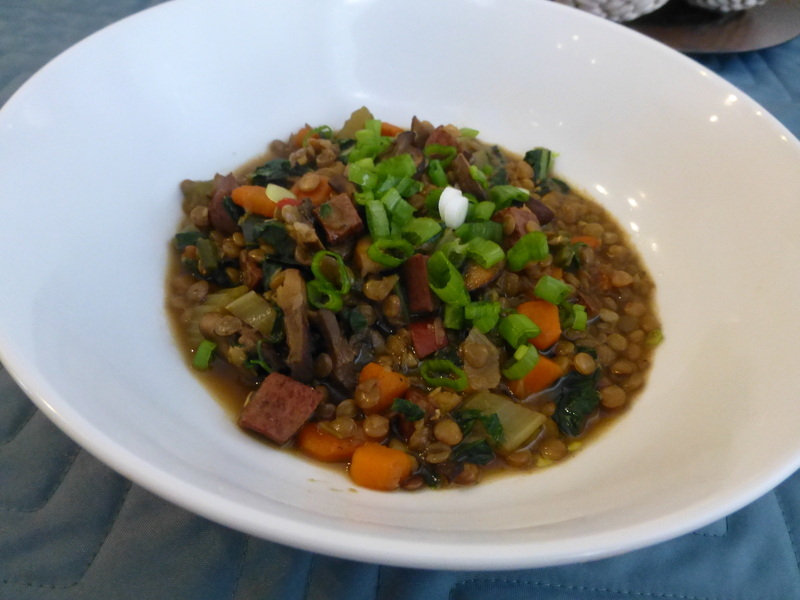 In about a half an hour when the lentils were tender I added larger chunks of the same vegetables plus some greens and the turkey sausage. Adding these components at the end of cooking insured that the vegetables would not be mush and all the flavor would not be cooked out of the sausage. I used Trader Joe’s small green lentils. I liked their flavor better than the larger brown ones I get from my usual grocery store. This entry was posted in Poultry, Vegetables and tagged carrots, Celery, greens, Onions, smoked turkey sausage. Bookmark the permalink.